After the 3 caches from the new Apley Castle series being published last night, another 4 of them came out at lunchtime today. There is still 1 yet to be published so it looks like a third visit to the area is on the books sometime soon! We were at Halfords in sunny Telford when I spotted the new caches on the iPhone so dashed round to the area and parked up in the same fisherman’s lay-by as I did last night. Off Sarah and myself set down the path, making hard work of navigating as we’d been caught short with no proper GPSr with us – just Isaac’s very old eTrex Yellow (useless under tree cover) and my iPhone (OK, but the maps look to be from OpenStreetMap, which is worse than useless round this area). We eventually arrived at the first cache and luckily the clue made the hide very obvious and I found the cache in the first place I looked. A nice FTF too! Next on the list was not too far away. As we approached, two people were taking pictures of each other by the very ornate gate into the woods. As they turned round we realised it was Paul and Izzy from Izzy and the Lizard King. They had just got FTF on the nearby cache, so I did the biz with the cache while everyone chatted away. We all set off for the next cache in the woods, which Izzy and Paul (and cannonedwards) had already DNF’d. We searched a very wide area but nothing even coming close to the hint had a cache. We gave up and moved on to the 4th new cache. This was a nice easy find thankfully and a Joint FTF with Paul and Izzy. 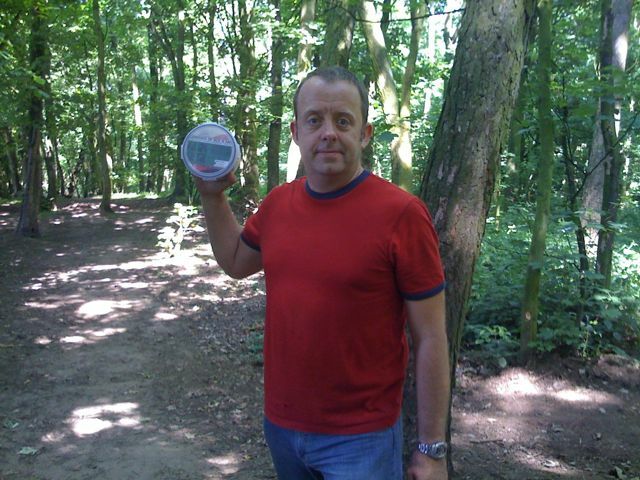 We all then returned to the DNF again and had an even more extensive search but the cache is nowhere to be found. We wonder if the cache owner has transposed part of the co-ords or the cache has gone missing before FTF. We then walked with Izzy and Paul to one of the caches I got a FTF on last night before continuing on to the Jeep and heading back home for some dinner.